1. Document with details available in Polish version of the site. 2. WOTY is organised by chronos24.pl (GTK Kiełtyka Tomasz based in Gliwice (44-100), Pszczynska 44 A, Poland), called hereinafter "chronos24.pl". 4. 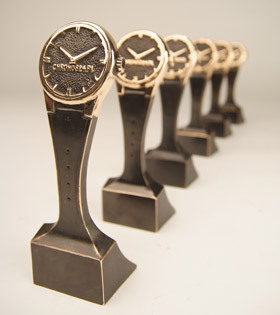 Watch seleted in "Public Prize" category, will be chosen by Internet users. One person can vote only one time! 6. The competition is free of charge. in second stage (01.08.2015 - 20.08.2015) each member of the jury will give points to proposed watches in all categories (from 10 to 1 points). in third stage (01.09.2015 - 15.10.2015) the watches, that earned most points will be presented to the public in right categories. in fourth stage (01.09.2015 - 30.09.2015) - basing on voting (5 to 1 points) - the jury will pick up winners in each category. Then again the jury will vote among all winners (5 to 1 points) to choose the Grand Prix award.